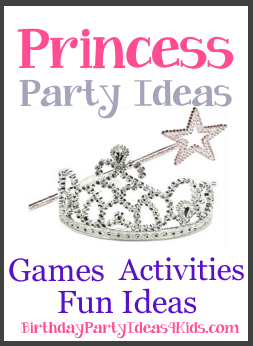 Create a Royal Ball for your little princess on her next birthday with these fun and easy Princess party ideas. Choose your favorite ideas for invitations, decorations, activities, games, food, favors and goody bags. Make invitations on white marbled paper (with pink lettering) or pink marbled paper (with black lettering). Roll the invitations up into a scroll and tie with a pretty ribbon, place a gold seal on the outside or slip the rolled up invitation through a ring with an oversized stone or jewel. Decorate with pretty pink tablecloths and sprinkle glitter and sequins on the table - then cover with a clear plastic tablecloth. Throw in splashes of purple or blue for fun. Cover the chairs with matching material then gather the material to the back of the chairs and secure with rubber bands. Place pretty flowers inside the rubber band for a elegant look. On the table place tiara's at each place setting. Fancy china would complete the look, or use pretty paper plates in a solid pink or grey. If you are using plastic cups make them extra special by sticking on “stick-on” jewels - looks really pretty with clear cups. Attach pink and white helium filled balloons to the back of the chairs. For a royal entrance place a red (or pink) carpet from the street to the front door leading into the house. An easy decorating idea is to blow up lots (and lots!) of pink and white balloons and place them covering the party room floor. This sets the mood for a very special party and kids love to dance and move through them. Hang clear Christmas lights around the party room. Streamers are also an easy way to make the room look festive. Cut 15 - 20 lengths of crepe paper at least 15 feet each. Start in the middle of the room and tape one end of each streamer in a 8 - 9” circle. One by one pick up the other end of the streamer and tape about 6 - 8 feet from the center circle. Create a dip in the center of the steamers - if you are feeling creative twist two colors of crepe paper together. If you are adventurous , and a little creative, make the front door look like the entrance to a castle - including the drawbridge. This is a great idea for when it is time to open the presents. Before the party decorate 2 chairs to look like thrones. You can use cardboard or drape a high back chair with a fancy blanket. Set the chairs up next to each other at the front of the room with a table in the middle of the chairs. Gather two sets of fun clothes (long dresses, tutu’s, high heels, tiaras, hats, wigs, long socks … etc. ) in two baskets. Place the baskets at one end of the room and make lines with tape on the other side of the room where the teams will line up. Divide guests into two teams. The first person in each line run to the baskets, put on the clothes … then run back to the starting line to tag a teammate … then run back to the basket and take off the funny items. When all the items are back in the basket they run to the starting line and tag the next person in line. The second person then goes and puts on all the items … etc. Before the party take a small box and wrap it in pretty paper. Attach a small prize to the outside of the paper and then wrap the box again in a different color paper. Continue until the box has been wrapped at least as many times as the number of guests you are expecting at the party. Have the girls sit in a circle and start playing music. The guests will pass the present around the circle until the music stops. When the music stops the princess holding the package will carefully unwrap one layer of paper and she gets to keep the prize. Start the music again and continue until everyone has had a chance to open the present and receives a prize. Played like the classic party game Pin the Tail on the Donkey, only guests pin a tiara on a poster of a princess. This is a fun game especially if you blow up lots and lots of balloons and spread them out on the floor. (It’s really fun if they completely cover the floor.) Put on some lively music and let the girls dance around in the balloons. Then stop the music and shout “freeze”. The dancing princesses must freeze until the music starts again. Pretty, Pretty Princess Is a favorite board game for most little girls. Easy to find at a toy store with the board games. 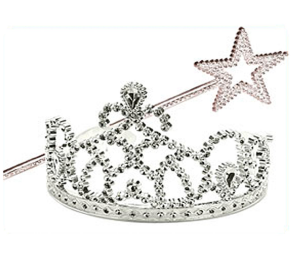 Princesses take turns winning jewelry to wear. If you have a scavenger hunt let this game be one of the treasures at the end and the girls can play it after the hunt. Have a Royal Princess Tea Party with pink lemonade in the tea pot and sugar cubes. Set out pretty plates of petite fours, chocolates and small finger sandwiches. Decorate pillow cases with pink fabric paint and write “Princess ________“ (name of girl). Bubble wands - princesses can also pop bubbles with the scepters or wands. Pink lemonade punch or pink lemonade served in a teapot that the guests can pour themselves. Leave out the sugar and let the guest sweeten their own drinks with sugar cubes. Make pretty sandwiches and cut them out with a star shaped cookie cutter. Cheese (cut with a cookie cutter into princess shapes) and crackers. Make a batch of rice krispie treats and cut out in heart shapes. Wand cookies - Make sugar cookies and cut into star shapes. Before baking place a long lollipop stick into each cookie and then decorate. Give as a treat at the party or wrap in cellophane and place in the goody bag. Pretty charm bracelets or necklaces. Pretty baskets decorated with stick on jewels.